For other uses, see Geronimo (disambiguation). Geronimo (Mescalero-Chiricahua language: Goyaałé [kòjàːɬɛ́] "one who yawns"; June 1829 – February 17, 1909) was a prominent leader of the Bedonkohe Apache who fought against Mexico and the United States for their expansion into Apache tribal lands for several decades during the Apache Wars. "Geronimo" was the name given to him during a battle with Mexican soldiers. His Chiricahua name is often rendered as Goyathlay or Goyahkla in English. After an attack by Mexican soldiers killed his mother, wife and three children in 1851, Geronimo joined revenge attacks on the Mexicans. During his career as a war chief, he was notorious for consistently leading raids upon Mexican provinces and towns, and later against American locations across Arizona, New Mexico and western Texas. In 1886 Geronimo surrendered to U.S. authorities after a lengthy pursuit. As a prisoner of war in old age he became a celebrity and appeared in fairs but was never allowed to return to the land of his birth. He later regretted his surrender and claimed the conditions he made had been ignored. Geronimo died in 1909 from complications of pneumonia at Fort Sill, Oklahoma. Geronimo, Chiricahua Apache leader. Photograph by Frank A. Rinehart, 1898. Apache is the collective term for several culturally related groups of Native Americans originally from the Southwest United States. The current division of Apachean groups includes the Navajo, Western Apache, Chiricahua, Mescalero, Jicarilla, Lipan, and Plains Apache (formerly Kiowa-Apache). Geronimo was born to the Bedonkohe band of the Apache, near Turkey Creek, a tributary of the Gila River in the modern-day state of New Mexico, then claimed by Mexico. His grandfather (Mahko) had been chief of the Bedonkohe Apache. He had three brothers and four sisters. Late one afternoon when returning from town we were met by a few women and children who told us that Mexican troops from some other town had attacked our camp, killed all the warriors of the guard, captured all our ponies, secured our arms, destroyed our supplies, and killed many of our women and children. Quickly we separated, concealing ourselves as best we could until nightfall, when we assembled at our appointed place of rendevous - a thicket by the river. Silently we stole in one by one, sentinels were placed, and when all were counted, I found that my aged mother, my young wife, and my three small children were among the slain. Geronimo's chief, Mangas Coloradas, sent him to Cochise's band for help in revenge against the Mexicans. It was during this incident that the name Geronimo came about. This appellation stemmed from a battle in which, ignoring a deadly hail of bullets, he repeatedly attacked Mexican soldiers with a knife. The origin of the name is a source of controversy with historians, some writing that it was appeals by the soldiers to Saint Jerome ("Jeronimo!") for help. Others source it as the mispronunciation of his name by the Mexican soldiers. Geronimo was raised with the traditional religious views of the Bedonkohe. When questioned about his views on life after death, he wrote in his 1905 autobiography, "As to the future state, the teachings of our tribe were not specific, that is, we had no definite idea of our relations and surroundings in after life. We believed that there is a life after this one, but no one ever told me as to what part of man lived after death ... We held that the discharge of one's duty would make his future life more pleasant, but whether that future life was worse than this life or better, we did not know, and no one was able to tell us. We hoped that in the future life, family and tribal relations would be resumed. In a way we believed this, but we did not know it." In his later years Geronimo embraced Christianity, and stated "Since my life as a prisoner has begun, I have heard the teachings of the white man's religion, and in many respects believe it to be better than the religion of my fathers ... Believing that in a wise way it is good to go to church, and that associating with Christians would improve my character, I have adopted the Christian religion. I believe that the church has helped me much during the short time I have been a member. I am not ashamed to be a Christian, and I am glad to know that the President of the United States is a Christian, for without the help of the Almighty I do not think he could rightly judge in ruling so many people. I have advised all of my people who are not Christians, to study that religion, because it seems to me the best religion in enabling one to live right." He joined the Dutch Reformed Church in 1903 but four years later was expelled for gambling. To the end of his life, he seemed to harbor ambivalent religious feelings, telling the Christian missionaries at a summer camp meeting in 1908 that he wanted to start over, while at the same time telling his tribesmen that he held to the old Apache religion. The first Apache raids on Sonora and Chihuahua took place during the late 17th century. To counter the early Apache raids on Spanish settlements, presidios were established at Janos (1685) in Chihuahua and at Fronteras (1690) in northern Opata country. In 1835, Mexico had placed a bounty on Apache scalps. Two years later Mangas Coloradas became principal chief and war leader and began a series of retaliatory raids against the Mexicans. Apache raids on Mexican villages were so numerous and brutal that no area was safe. Between 1820 and 1835 alone, some 5000 Mexicans died in Apache raids, and 100 settlements were destroyed. As war chief, Geronimo was notorious for urging raids and war upon Mexican Provinces and later against American locations in the southwest. Attacks and counter-attacks were common. In December 1860, thirty miners launched a surprise attack on an encampment of Bedonkohes Apaches on the west bank of the Mimbres River. According to historian Edwin R. Sweeney, the miners "...killed four Indians, wounded others, and captured thirteen women and children." Retaliation by the Apache again followed, with raids against U.S. citizens and property. —-Geronimo, Geronimo's story of his life, Kas-Ki-Yeh, 1909. According to National Geographic, "... the governor of Sonora claimed in 1886 that in the last five months of Geronimo's wild career, his band of 16 warriors slaughtered some 500 to 600 Mexicans." —-Geronimo, My Life: The Autobiography of Geronimo, 1905. In 1873 the Mexicans once again attacked the Apache. After months of fighting in the mountains, the Apaches and Mexicans decided upon a peace treaty at Casa Grande. After terms were agreed upon, the Mexicans gave mescal to the Apache and while they were intoxicated, the Mexican troops attacked and killed twenty Apaches and captured many more. The Apache were forced to retreat into the mountains once again. Though outnumbered, Geronimo fought against both Mexican and United States troops and became famous for his daring exploits and numerous escapes from capture from 1858 to 1886. One such escape, as legend has it, took place in the Robledo Mountains of southwest New Mexico. The legend states that Geronimo and his followers entered a cave, and the U.S. soldiers waited outside the cave entrance for him, but he never came out. Later it was heard that Geronimo was spotted outside, nearby. The second entrance through which he escaped has yet to be found and the cave is still called Geronimo's Cave, even though no reference to this event or this cave has been found in the historic or oral record. Moreover, there are many stories of this type with other caves referenced that state that Geronimo or other Apaches entered to escape troops but were not seen exiting. These stories are in all likelihood apocryphal. —-Geronimo, Geronimo's story of his life, Coming of the White Men, 1909. At the end of his military career, he led a small band of 38 men, women, and children. They evaded thousands of Mexican and American troops for over a year, making him the most famous Native American of the time and earning him the title of the "worst Indian who ever lived" among white settlers. According to James L. Haley, "About two weeks after the escape there was a report of a family massacred near Silver City; one girl was taken alive and hanged from a meat hook jammed under the base of her skull." His band was one of the last major forces of independent Native American warriors who refused to accept the United States occupation of the American West. The Army with Apache Scouts pursued Geronimo and his small band, initially under the command of Gen George Crook. Geronimo negotiated a "surrender with Gen Crook but fled the next morning with a small portion of his followers." Gen Miles was then brought in to command US Forces. In 1886, General Nelson A. 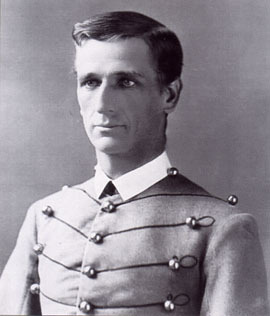 Miles selected Captain Henry Lawton, in command of B Troop, 4th Cavalry, at Fort Huachuca, and First Lieutenant Charles B. Gatewood, to lead the expedition that brought Geronimo and his followers back to the reservation system for a final time. Lawton was given orders to head up actions south of the U.S.–Mexico boundary where it was thought Geronimo and a small band of his followers would take refuge from U.S. authorities. Lawton was to pursue, subdue, and return Geronimo to the U.S., dead or alive. Lawton's official report dated September 9, 1886 sums up the actions of his unit and gives credit to a number of his troopers for their efforts. Geronimo gave Gatewood credit for his decision to surrender as Gatewood was well known to Geronimo, spoke some Apache, and was familiar with and honored their traditions and values. He acknowledged Lawton's tenacity for wearing the Apaches down with constant pursuit. Geronimo and his followers had little or no time to rest or stay in one place. Completely worn out, the little band of Apaches returned to the U.S. with Lawton and officially surrendered to General Miles on September 4, 1886 at Skeleton Canyon, Arizona. —-Geronimo, Geronimo's story of his life, In Prison and on the war path, 1909. Charles B. Gatewood, known to the Apache as Bay-chen-daysen, "Long Nose." 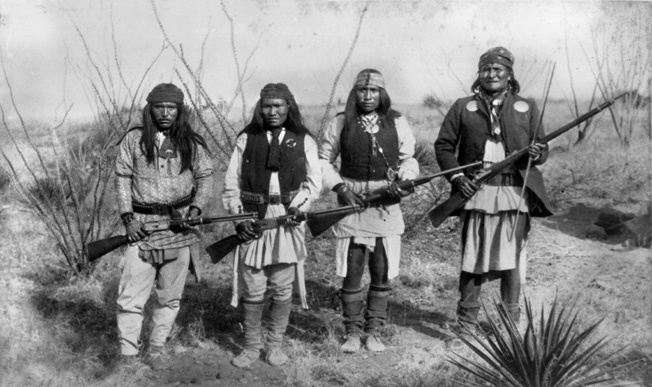 When Geronimo surrendered he had in his possession a Winchester Model 1876 lever-action rifle with a silver-washed barrel and receiver, bearing Serial Number 109450. It is on display at the United States Military Academy, West Point, New York. Additionally he had a Colt Single Action Army revolver with a nickel finish and ivory stocks bearing the serial number 89524, and a Sheffield Bowie knife with a dagger type of blade and stag handle made by George Wostenholm in an elaborate silver-studded holster and cartridge belt. The revolver, rig, and knife are on display at the Fort Sill museum. The debate remains whether Geronimo surrendered unconditionally. He pleaded in his memoirs that his people who surrendered had been misled, and that his surrender as a war prisoner was conditioned in front of uncontested witnesses (especially General Stanley). General Oliver O. Howard, chief of US Army Division of the Pacific, said on his part that Geronimo's surrender was accepted as that of a dangerous outlaw without condition. Howard's account was contested in front of the US Senate. Band of Apache Indian prisoners at rest stop beside Southern Pacific Railway, near Nueces River, Tex. (Geronimo is third from the right, in front), September 10, 1886. Geronimo and other Apaches, including the Apache scouts who had helped the army track him down, were sent as prisoners to Fort Sam Houston in San Antonio Texas. The Army held them there for about six weeks before they were sent to Fort Pickens, in Pensacola, Florida, and his family was sent to Fort Marion. They were reunited in May 1887, when they were transferred to Mount Vernon Barracks near Mobile, Alabama for seven years. In 1894, they were moved to Fort Sill, Oklahoma. In his old age, Geronimo became a celebrity. He appeared at fairs, including the 1904 World's Fair in St. Louis, where he reportedly rode a ferris wheel and sold souvenirs and photographs of himself. However, he was not allowed to return to the land of his birth. He rode in President Theodore Roosevelt's 1905 inaugural parade. Geronimo in a 1905 Locomobile Model C, taken at the Miller brothers' 101 Ranch located southwest of Ponca City, Oklahoma, June 11, 1905. —-Geronimo, Geronimo's story of his life, At the World's Fair, 1909. In February 1909, Geronimo was thrown from his horse while riding home, and had to lie in the cold all night before a friend found him extremely ill. He died of pneumonia on February 17, 1909, as a prisoner of the United States at Fort Sill, Oklahoma. On his deathbed, he confessed to his nephew that he regretted his decision to surrender. His last words were reported to be said to his nephew, "I should have never surrendered. I should have fought until I was the last man alive." He was buried at Fort Sill, Oklahoma in the Apache Indian Prisoner of War Cemetery. Geronimo's grave at Fort Sill, Oklahoma in 2005. Six members of the Yale secret society of Skull and Bones, including Prescott Bush, served as Army volunteers at Fort Sill during World War I. It has been claimed by various parties that they stole Geronimo's skull, some bones, and other items, including Geronimo's prized silver bridle, from the Apache Indian Prisoner of War Cemetery at Fort Sill, Oklahoma. Alexandra Robbins, author of a book on Skull and Bones, says this is one of the more plausible items said to be in the organization's Tomb. In 2009, Ramsey Clark filed a lawsuit on behalf of people claiming descent from Geronimo, against several parties including Barack Obama, Robert Gates, and Skull and Bones, asking for the return of Geronimo's bones. An article in The New York Times states that Clark "acknowledged he had no hard proof that the story was true." Investigators, including Bush family biographer Kitty Kelley and the pseudonymous Cecil Adams, say the story is untrue. A military spokesman from Fort Sill told Adams, "There is no evidence to indicate the bones are anywhere but in the grave site." Jeff Houser, chairman of the Fort Sill Apache tribe of Oklahoma, calls the story a hoax. Thanks to a 1939 movie about Geronimo, US paratroopers traditionally shout "Geronimo" to show they have no fear of jumping out of an airplane. Other Native American-based traditions were also adopted in WWII, such as "Mohawk" haircuts, face paint and spears on their unit patches. The United States military used the code name "Geronimo" for the raid that killed the al-Qaida leader Osama bin Laden in 2011; but its use outraged some Native Americans. "Operation Geronimo" was subsequently reported to be named or renamed "Operation Neptune['s] Spear". Harlyn Geronimo, Geronimo's great-grandson, said to the Senate Commission on Indian Affairs, "(use of 'Geronimo' in the raid that killed Bin Laden) either was an outrageous insult (or) mistake. And it is clear from the military records released that the name Geronimo was used at times by military personnel involved for both the military operation and for Osama Bin Laden himself." In the USPS serial "Legends of the West", a 29¢ postage stamp showing Geronimo was issued October 18, 1994. Geronimo has been featured in many films and television series dealing with the American Southwest. Michael Carr played a "Young Geronimo" in the 1959 episode "Wyatt Wins One" of the ABC/Desilu western series, The Life and Legend of Wyatt Earp, with Hugh O'Brian in the title role. In the story line Earp befriends Geronimo when the Apache are falsely accused of rustling cattle from Newman Haynes Clanton, head of the Clanton Gang. Geronimo: An American Legend is a 1993 film, directed by Walter Hill from a screenplay by John Milius and starring Wes Studi as Geronimo. In 1962, Chuck Connors, while still making episodes of ABC's The Rifleman, was cast in the title role of the film, Geronimo. The parody movie Hot Shots! Part Deux parodies the usage of Geronimo's name in a parachute jump with a stereotypically-dressed Native American making such a parachute jump. Instead of shouting "Geronimo! ", he shouts "Me! "—implying he is Geronimo. ↑ Mike Campbell. "Meaning, Origin and History of the Name Geronimo". Behind the Name. http://www.behindthename.com/name/geronimo. Retrieved April 19, 2012. ↑ "Geronimo". October 1992. p. 52. ↑ 4.0 4.1 S.M. Barrett, ed (1909,1915). "Kas-Ki-Yeh" (Google Books). Geronimo's story of his life. New York: Duffield & Company. http://www.let.rug.nl/usa/B/geronimo/geroni6.htm. Retrieved May 10, 2011. ↑ 6.0 6.1 S.M. Barrett, ed (1909,1915). "At the World's Fair" (Google Books). Geronimo's story of his life. New York: Duffield & Company. http://www.let.rug.nl/usa/B/geronimo/geroni19.htm. Retrieved May 10, 2011. ↑ 7.0 7.1 7.2 Adams, Alexander B. (1990). Geronimo: a Biography. Da Capo Press. p. 391. ISBN 978-0-306-80394-9. ↑ Debo, Angie (1989). Geronimo: The Man, His Time, His Place. Oklahoma City: University of Oklahoma Press. p. 13. ISBN 978-0-8061-1828-4. http://books.google.com/books?id=N-jGArzx7hkC&pg=PA13. Retrieved February 2, 2012. ↑ "Wives and burial place of Geronimo". http://www.aaanativearts.com/apache/geronimo-wives-burial-place.htm. Retrieved September 4, 2009. ↑ Gatewood, Charles B. (2009). Louis Kraft. ed. Lt. Charles Gatewood & His Apache Wars Memoir. University of Nebraska Press. p. xxxiii. "His ninth wife was Azul (1850–1934), a Chokonen who had been captured by Mexicans early in her life . She didn't marry Geronimo until the Apache prisoners of war moved to Forty Sill, Oklahoma Territory(probably 1907). She remained with him until his death in 1909 and never remarried." ↑ 17.0 17.1 17.2 17.3 My Life: The Autobiography of Geronimo My Life: The Autobiography of Geronimo. Fireship Press. 2010. ISBN 978-1-935585-25-1. http://books.google.com/?id=Pt3ys6DmI1cC&dq#v=onepage&q=&f=false My Life: The Autobiography of Geronimo. Retrieved 2011-05-10. ↑ 19.0 19.1 19.2 19.3 S.M. Barrett, ed (1909,1915). "Heavy Fighting" (Google Books). Geronimo's story of his life. New York: Duffield & Company. http://www.let.rug.nl/usa/B/geronimo/geroni10.htm. Retrieved May 10, 2011. ↑ 21.0 21.1 21.2 "The American Experience, We Shall Remain: Geronimo". http://www.pbs.org/wgbh/amex/weshallremain/the_films/episode_4_trailer. Retrieved November 12, 2009. ↑ 23.0 23.1 23.2 23.3 23.4 Capps, Benjamin (1975). The Great Chiefs. Time-Life Education. p. 240. ISBN 978-0-316-84785-8. ↑ Herring, Hal (2008). Famous Firearms of the Old West: From Wild Bill Hickok's Colt Revolvers to Geronimo's Winchester, Twelve Guns That Shaped Our History. TwoDot. p. 224. ISBN 0-7627-4508-8. ↑ "Gulf Islands National Seashore – The Apache (U.S. National Park Service)". nps.gov. http://www.nps.gov/guis/historyculture/the-apache.htm. Retrieved May 24, 2009. ↑ "Death of Geronimo, History Today". Historytoday.com. http://www.historytoday.com/MainArticle.aspx?m=33177&amid=30265445. Retrieved April 19, 2012. ↑ "American Experience We Shall Remain: Geronimo". PBS. http://www.pbs.org/wgbh/amex/weshallremain/files/transcripts/WeShallRemain_4_transcript.pdf. ↑ 31.0 31.1 Pember, Mary Annette (July 9, 2007). "Tomb Raiders". Diverse Issues in Higher Education. http://diverseeducation.com/article/8259/. Retrieved February 28, 2009. ↑ 32.0 32.1 Lassila, Kathrin Day; Mark Alden Branch (May/June 2006). "Whose Skull and Bones?". Yale Alumni Magazine. http://www.yalealumnimagazine.com/issues/2006_05/notebook.html. Retrieved February 28, 2009. ↑ Kelley, Kitty (2004). The Family: The Real Story of the Bush Dynasty. Doubleday. pp. 17–20. ISBN 0-385-50324-5. ↑ Chuck Anderson. "Geronimo yell of World War II paratroopers". B-westerns.com. http://www.b-westerns.com/geronimo.htm. Retrieved 2013-02-16. ↑ "Osama Bin Laden: Why Geronimo?". BBC News. May 3, 2011. http://www.bbc.co.uk/news/world-us-canada-13265069. Retrieved May 4, 2011. ↑ Jake Tapper (May 4, 2011<!- – 12:47 pm EDT-->). "US Official: "This Was a Kill Mission"". ABC News. http://blogs.abcnews.com/politicalpunch/2011/05/us-official-this-was-a-kill-mission.html. Retrieved May 5, 2011. ↑ Multiamerican. "An unpardonable slander:’ The controversy over the use of ‘Geronimo’ in bin Laden operation". http://multiamerican.scpr.org/2011/05/an-unpardonable-slander-the-controversy-over-the-use-of-geronimos-name-in-bin-laden-operation/. Retrieved May 7, 2011. ↑ "American Indian Subjects on United States Postage Stamps". About.usps.com. http://about.usps.com/who-we-are/postal-history/american-indian-stamp-subjects-2011.htm. Retrieved September 4, 2013. ↑ ""Wyatt Wins One", The Life and Legend of Wyatt Earp, November 10, 1959". Internet Movie Data Base. http://www.imdb.com/title/tt0631948/. Retrieved August 12, 2013. Opler, Morris E.; & French, David H. (1941). Myths and tales of the Chiricahua Apache Indians. Memoirs of the American folk-lore society, (Vol. 37). New York: American Folk-lore Society. (Reprinted in 1969 by New York: Kraus Reprint Co.; in 1970 by New York; in 1976 by Millwood, NY: Kraus Reprint Co.; & in 1994 under M. E. Opler, Morris by Lincoln: University of Nebraska Press. ISBN 0-8032-8602-3). Pinnow, Jürgen. (1988). Die Sprache der Chiricahua-Apachen: Mit Seitenblicken auf das Mescalero [The language of the Chiricahua Apache: With side glances at the Mescalero]. Hamburg: Helmut Buske Verlag. Pember, Mary Annette. (July 12, 2007). "'Tomb Raiders': Yale's ultra-secret Skull and Bones Society is believed to possess the skull of legendary Apache chief Geronimo." Diverse Issues in Higher Education 24(11), 10–11. Retrieved April 23, 2008. Rielly, Edward. "Geronimo: The Warrior", article for The Public Domain Review, 2011. Geronimo Surrender Monument at Apache, Arizona. Morgan Benson and Robert Schaller (Jan 1, 2001). "Geronimo". Native American Indian Leader. Find a Grave. http://www.findagrave.com/memorial/387. Retrieved Aug 18, 2011. Germonimo: The Warrior article by Edward Rielly on the personal tragedy which underpinned Geronimo's warrior life.